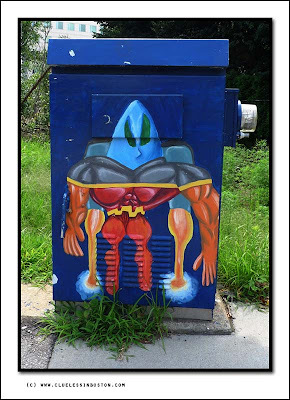 Painted electrical box on city street. I like that idea! Much better than a plain old boring electrical box. LOL funny indeed!I think someone there is very talented! There is a second one on Parker St by Delle on Mission Hill. Great idea. Haha, scrolling down from your masthead photo to this one really underscores the diversity of sights to be appreciated in Boston. I've seen worse public art. It cheers up what would be a dull box...fun. Funky! The invasion has begun!